Board games are back. While I'm sure most of you left those thin rectangular boxes to collect dust down in the basement, a new breed of board games are here and they are faster, smarter, and meaner than before. Members of the old dynasty – I'm looking at you Monopoly, Life, and Sorry – are relics from the dark and unenlightened past. With this resurgence, everyone needs to be reminded of why tabletop games matter and ultimately what you could be missing. Don't worry Erie, you haven't been forgotten. Scott Mellon and I sat down and talked at length about tabletop gaming and Erie. Scott is a knowledgeable tabletop player, board-game master, and an all-around nice guy. He is constantly bursting with a smile and is just waiting for someone to talk board games with. He also happens to help organize Erie's own Day of Games. We started our conversation about the differences between the old –or American style – and the new – or European style – of board games. "Luck plays a big, big part," Scott says, describing American-style games. Think Risk and Monopoly, where the focus is on eliminating players and rolling dice. Scott said that Ameritrash games are, "...about the theme of the game, where the mechanics may not be good or elegant." Ameritrash, is another loving term used to describe the flashy nature of American games to help cover the shallow gameplay. As a counterpoint to American-style games, European-style games "... have a lot more skill, and strategy." Scott adds that it isn't all so rigid and serious, "All European-style games have some form of randomness. In all Euro games there's some luck, there's some unknown factor; otherwise it would just be Chess." Euro Style games prioritize player interaction throughout the game and use the 'luck' factor just a little to help keep the game fresh on each consecutive play session. A really good example for a first game into this new style is Days of Wonder's Smallworld. Smallworld blends European and American styles to create a wonderful first encounter for novice and veteran tabletoppers. Based in a fantasy setting, players get to control various races like elves, dwarves, and zombies. Scott admits, "There is something about that game that appeals to everyone. It's a game of conflict." 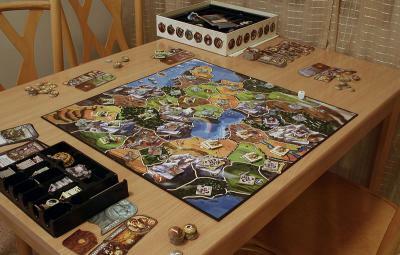 Smallworld pits players' civilizations against each other as they vie for control in the 'small world.' My 'Seafaring Trolls' versus your 'Flying Orcs' perhaps. Smallworld pulls familiar concepts from Risk. You have an army of tokens that you use to control regions on the board and are awarded points at the end of the round for controlled regions. And that is where the similarities end. In Smallworld, games have a set number of rounds. The use of dice is exchanged for a 'most tokens wins' method. You can and should eventually change your civilization. Tired of those Seafaring Trolls? Well, why not switch for some Diplomat Zombies? This adds a wonderful reset button for players who feel behind. I've played a game where I felt so far behind, but with a few strategic moves I was able to defeat my foes. Let's go back in time for just a second and remember some of the lessons we learned growing up. Sure, we all remember those games of Monopoly and Risk that simply would not end. Smallworld not only fixes that issue with a set round limit, it also helps create another aspect I love of tabletop games: The ability to be engaged in a contextualized conversation with friends and family. One of my favorite post-Thanksgiving dinner activities is spending a few hours digesting over board games with my siblings. Erie has something to offer those who wish to share their enjoyment of games like Smallworld. Erie's Day of Games this year happens October 26 to 27 at the Quality Inn and Suites. Why not grab some friends or family members and join Scott, Me, and many others for some board games? And if you get to try Smallworld may I recommend the Pillaging Skeletons?